Get your fix of NITRO and JET CARS! Come and meet the Famous Eddie Munster (Butch Patrick) from the TV The Munsters! Watch on Friday and Saturday as the Munster Koach and the Drag-U-La dual it out on the drag strip! A weekend full of Nitro & Jet Cars a long with the famous Eddie Munster (Butch Patrick from the TV show The Munsters! Watch as the Drag-U-La and the Munster Koach race down the track Friday AND Saturday night! 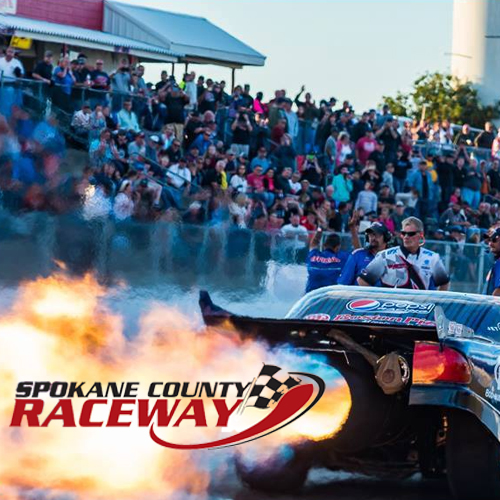 Nitro Funny Cars, Nitro Fuel Altereds, 10.5 & 8.5 Radial Class, Top Fuel Rear Engine Dragsters, NW Nostalgia Tour, Blown Alcohol Funny Cars & Dragsters, Ed the Outlaw Jones, Nitro Mike Wheel Standers, Jet Cars AND Helicopter Rides by Inland Helicopters. Times: Friday Qualifying for all classes starts at 3:00PM. Saturday: Qualifying starts at 1:00PM, eliminations at 5:00PM.